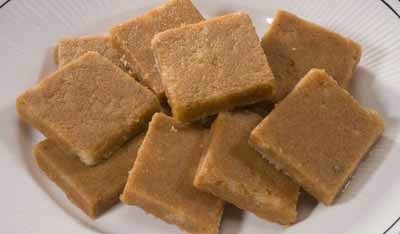 Home / CookBook / Gujarati Sweet "Sukhadi Recipe"
This recipe is my favorite Gujarati sweet dish. it requires very few ingredients and few processing but the end result is totally yum. This recipe is for all sweet lovers. 1. Add ghee in a pan. 2. Heat the ghee and then add wheat flour. 3. Mix well on a medium flame until the flour is golden brown then add the cashew and almond powder. 4. Switch off the gas and then add the jaggery to it and mix well. 5. Pour the mixture in plate greeced with ghee. 6. Allow it to cool and then cut it into pieces.